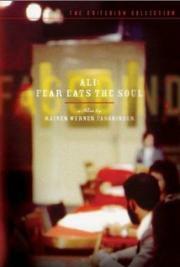 Emmi, a woman truly in the second half of life falls in love with Ali, an more than ten years younger Arab guest worker. Beautiful, very interesting elipses. E mentioned that work ruins his health - very itneresting to include that. The first two thirds worked very well for me as an unfortunately still timely depiction of racism. The fact that overcoming it was due to material concerns is an interesting observation. But it overall lacks so much social/class analysis. The third part exemplifies it: out of the blue sky, Emmi refuses to go towards Ali who, in utter disregard of his previous characterization, starts wandering away. Except for allusions, virtually no social analysis is provided. 26 August 18 & Fassbinder's spectacular space use, simple yet impressive camera movements and the minimal performance of the acting is impressive. I haven't seen such a fragile film in a long time. Finally a movie that depicts the dark reality of people purchasing drinks and then not drinking them. Among Fassbinder's most visually attractive films, and yet the sparseness that occupies every shot (extending to the script) is a great device for establishing open spaces that you can feel. I'm sure this is all very conducive to analysis, but analysis is not the first thing I feel like conducting so shortly after having seen it. The fact is, it is a very simple film, and much of its' power comes from not beating around the bush. The open ending is what makes this a masterpiece. Racism is not just beaten. Everyone is flawed. I felt intense weltschmerz while watching this film. I can easily see why this is among Aki Kaurismäkis favorites.